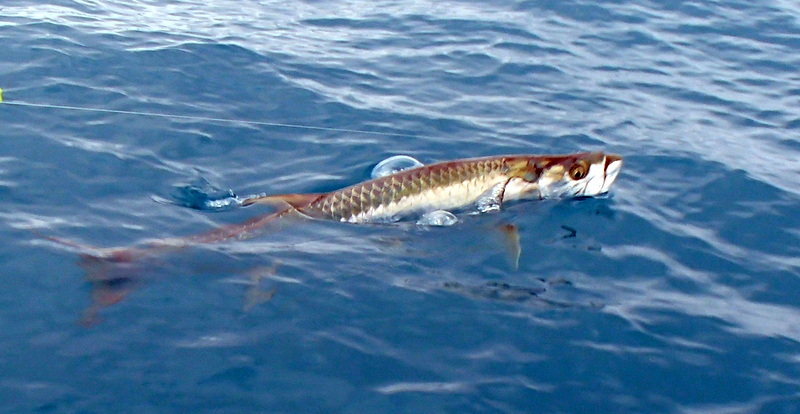 It still is the number one fish in the Florida Keys that guys on fishing holidays want to catch a big tarpon. Well this weeks guys have done very well I still don’t think Geoff and Simon know just how well for both guys to play fish for over 3 hrs and get near 200 lb tarpon to the boat. For poor Robin this tarpon fishing had become a spectator sport his two fish had found the concrete very soon so off we went to put this right. 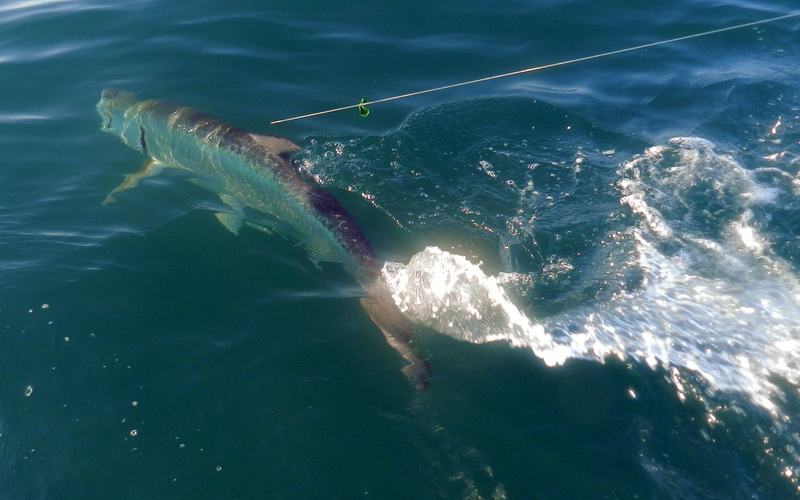 Normal start and this week the tarpon have been on fire so very soon it was fish on. Well at last Robin had a well behaved fish on very soon we were in clear water and the other two were joking about a 3 hr fight. In all fairness I don’t think Robin wanted to join the club and a normal fish would be just fine. Well as the daylight came with a spectacular Florida Keys sunrise the fish was beat and at well under an hour Robins dreams had been answered. 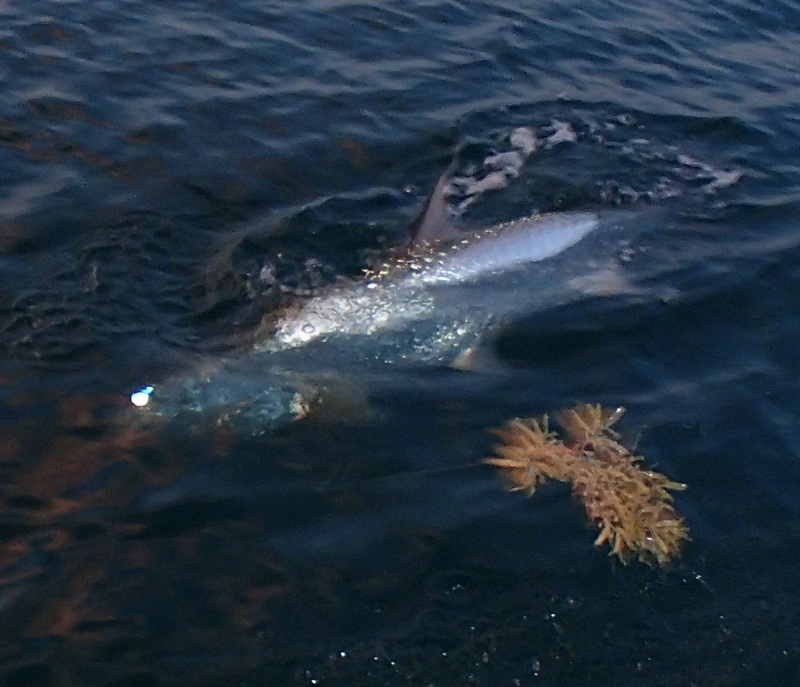 We lost this fish at the tape but and honest 100 lb maybe 120 lb but job done and three very happy tarpon anglers. I still find it hard to believe that these magnificent fish have been doing this since prehistoric times well before any man even existed let alone fished. So much more has gone on this week two fish have even jumped into the boat as I have a week of next week lots of time to blog. The three hour club ? Well they say lightning does not strike in the same place twice but the other day’s tarpon fishing it all seemed as though we had done this before. It started as normal in the Florida Keys a 4 am start and down to the bridge the tarpon were on fire did not even get the second rod in Robin shouted fish on. Well this was a dirty fish straight round the concrete and back out fish off. Next rod in the water it was Simon’s turn to shout fish on you dream about days like this. This was a much nicer fish and straight through the bridge and out in the Atlantic just pulling line like Geoff’s the day before. 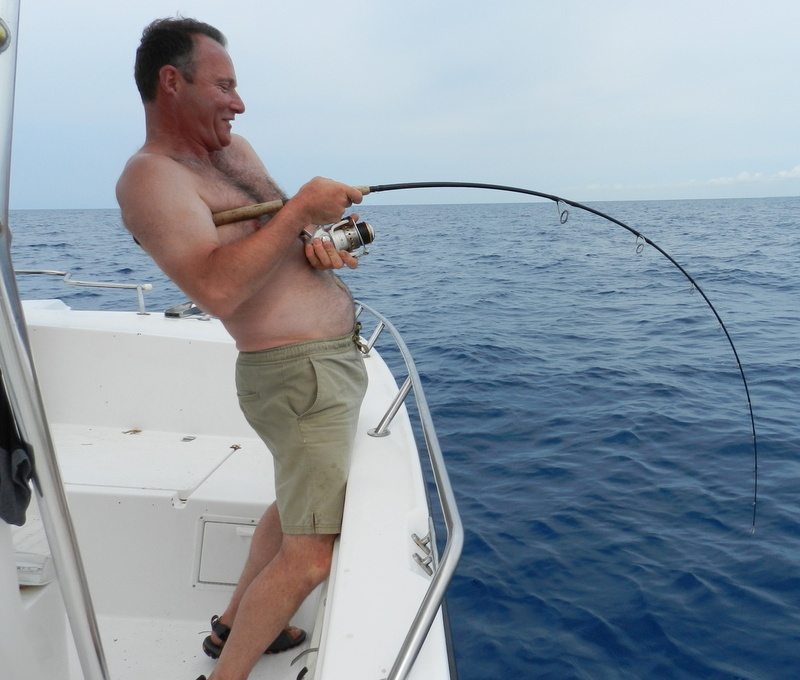 In fact it was very like Geoff’s a very, very big fish we were all joking your turn to do three hours of pain. Well even stranger the fish was on the same track less a few degrees and the first hour came and went as did the second and the third. 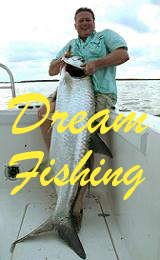 Totally unreal I have now been doing fishing holidays in the Florida Keys for over eight years and never had a three hour fight till the other day and to get an other one the next day amazing. Well we got the fish to the boat after 3 hrs 5 mins and a fight that went 3.54 miles from the bridge in the crystal clear waters the fish was just jaw dropping. Trying to get the fish to the tapes is not easy maybe you could fight them longer but then the fish would be dead and a fish this big is over 40 years old and deserve to go back with a fighting chance. At the tape it gave one very stong pull and it was off a done deal but no acurate numbers you can see from one of the photos just how big its back was a huge girth. I would say well over 6 ft long meaning high hundreds and again very near 200 lb Simon had just joined the 3 hr tarpon club ! Comments Off on The three hour club ? There are some days in the Florida Keys that turn into very special days in fact a day of a lifetime, yesterday was one of those days. 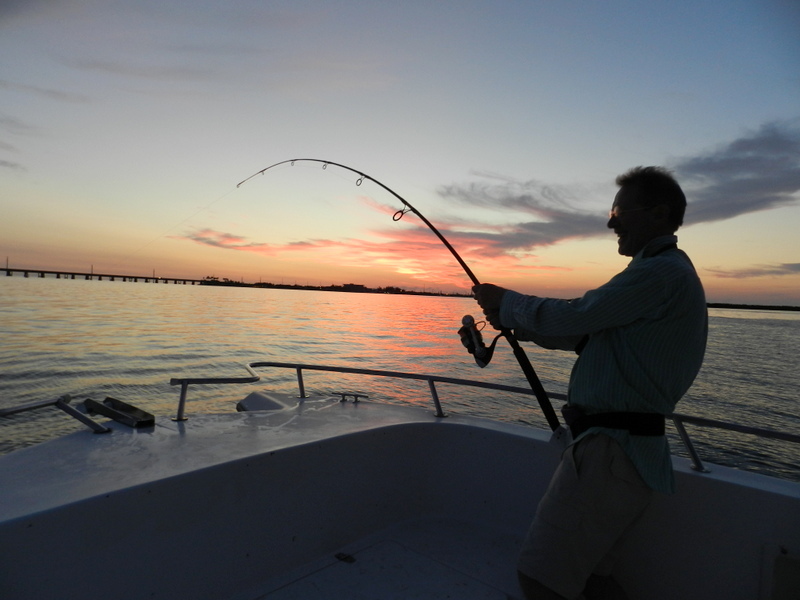 It started as a normal tarpon day 4 am start and down to 7 mile bridge and fish our favorite channel. No fish so we moved to fish the bank near the bridge with the chance of permit as well but no joy either. As it was getting light we went back to the bridge and fished near an other boat just in case he had seen fish. Soon we saw a tarpon role so we were all just waiting then Geoff’s ballon started to move to the left, winding like a mad man a fish was soon on. Unlike most tarpon this fish did not jump but was very strong so we followed then a massive tarpon jumped and it was Geoff’s wow. It was very good to us and started to go with the tide into the Atlantic and not hang around the bridge. So started a long hard fight I was having to follow at about 1.5 miles an hour there was nothing Geoff could do. Well the first hour came and went as did the second hour and the fish was still jumping just so much power. The third hour also came and went and it was still jumping, the bridge was a long way away. 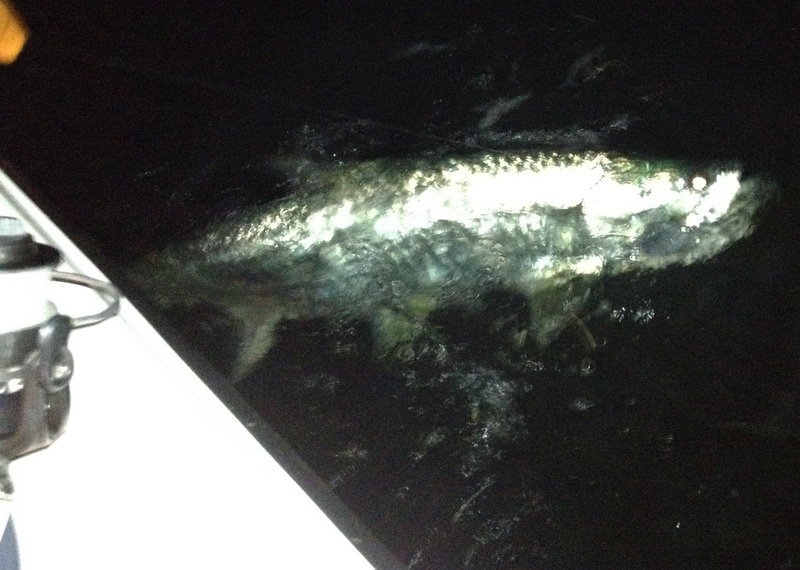 Just incredible I have never seen a tarpon like this its back was as big as a horse we were all just shaking our heads. Well after 3 hrs 20 mins we had it on the leader three times I had it to the boat but it was such a big fish as we tried to get to the tape measure the leader broke. I must say I have never seen anyone fight a big fish as well as Geoff did at the end he was wrecked but the smile said it all. So how big was it well any fish that fights for over 3 hrs is very big we ended up 4.97 miles from the hook up. Last year we had a 80 x 44 in fish which went 209 lbs this was at least as big as that one and might have even been bigger. But it was one very, very special fish and a day of a life time. Comments Off on What a kipper ! Always nice to see newcomers to our fishing holidays and for the next ten days we have Simon and Jeff from Jersey and Robin from my neck of the woods Newcastle. First day with calm seas we went offshore after dorado and permit both were not playing but as is the magic of the Florida Keys we had some good rod bending action with jacks. 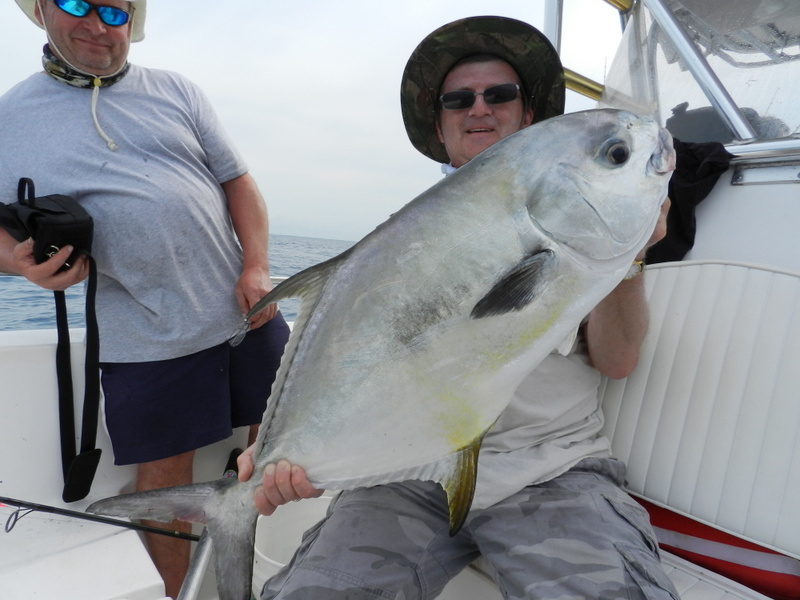 Jacks are are very close cousin of the permit and we found these in 110 ft and they never give up lost a couple to shark and kept three for bait. Day two a big grouper was on the list so off to our favorite wreck in the bay. Tides were a nightmare and you have to be right or no fish. 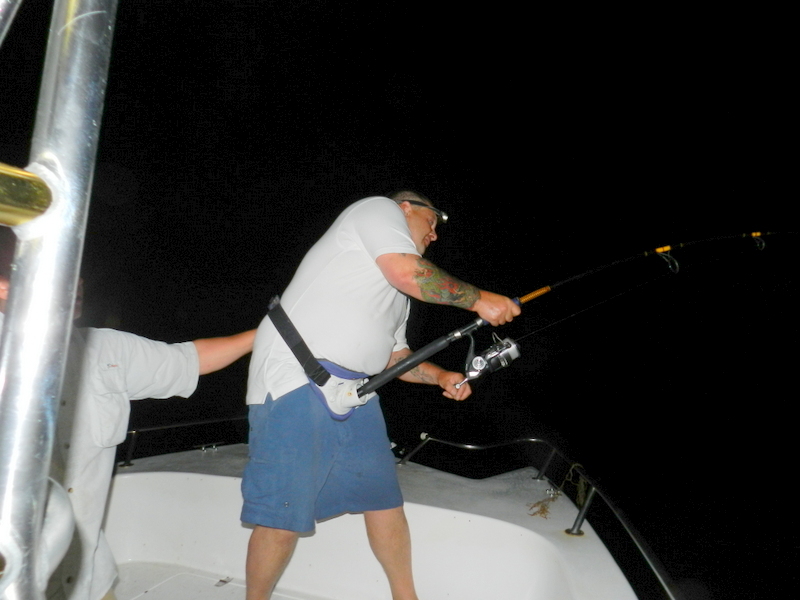 We had a small one for us about 150 lb but it was just not right for the big ones so off to an other wreck. This new wreck I have only had the numbers for a couple of months for some reason has some huge barracuda. Why I don’t know it is nearly 20 miles in the bay but with in minutes a big one was under the boat and after some teasing with a tube lure Simon was on. 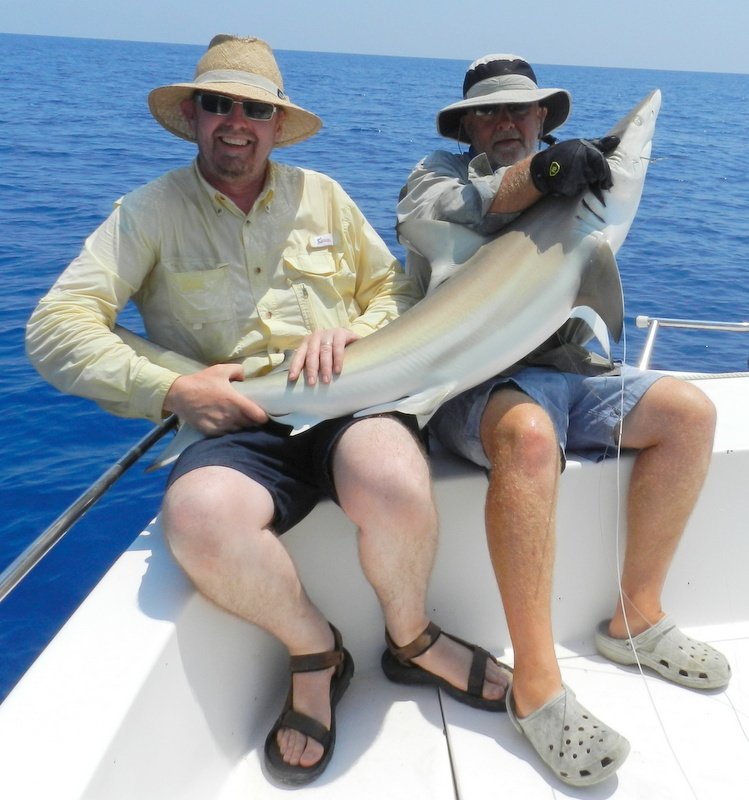 Then it became shark city with hard fighting blacktip and blacknose so much fun on light gear. We were rocked by a grouper so as the weather was getting worse we decied to drift a massive bait about 9 lb to see if there was a big one. Well we had one take and any fish that takes a 9 lb bait is not a small fish so we will be back. 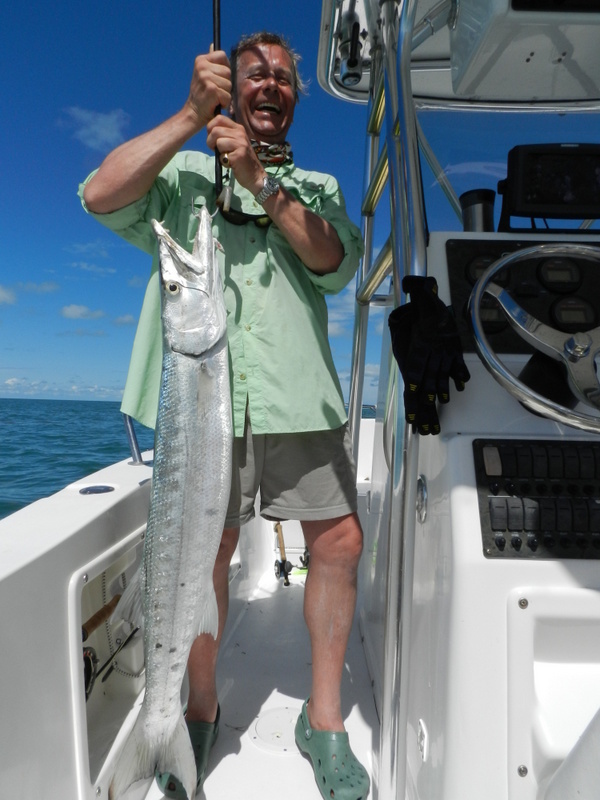 On the last drift Jeff had a 20 lb + barracuda which jumped at least 10 ft in the air awesome or what. The other day while wrecking on my favorite wreck in the bay we had over four grouper over 100 lb when I noticed a 5 lb + jack in the bait box. We always keep a few jacks for cut bait and if there is no fresh they make a good shark bait, so I said to the guys do you want to do something silly. What they all said yes, I replied why dont we use the whole fish and go for a big one I know they are here as we have had fish near 400 lb from this mark. So reel locked up no drag at all the bait went down and the float went under first run. Now you know if you are using a 5 lb bait it will not be small and after setting the hook we were into a monster. For some strange reason the was my first ever Goliath that did not go straight back to the wreck instead it went north into clear ground. After a good battled I was able to work the leader and with the water boils I knew it was a very big fish. As it broke the surface it was an Oh My God moment this was a very special fish well over 500 lb and very unhappy. Unfortunately we only managed one pic as this one was a very shy fish but you can see from the dorsal fish just how big it was. The mad thing about this wreck it is in only 10 ft of water, yes just 10 ft . During all my years in the Florida Keys and fishing this wreck I have never seen it and it comes up to 5 ft. Maybe this is why the fish stay and grow more murky water to hunt and they feel safe all I know it is a fun place to fish if you want big. Comments Off on A very very big fish! 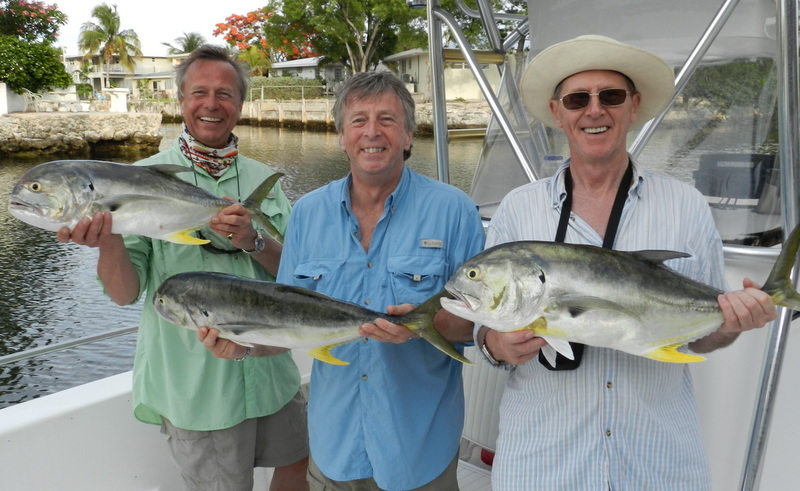 For a lot of guys on a fishing holiday in the Florida Keys permit is number two on the list and some people it is number one. 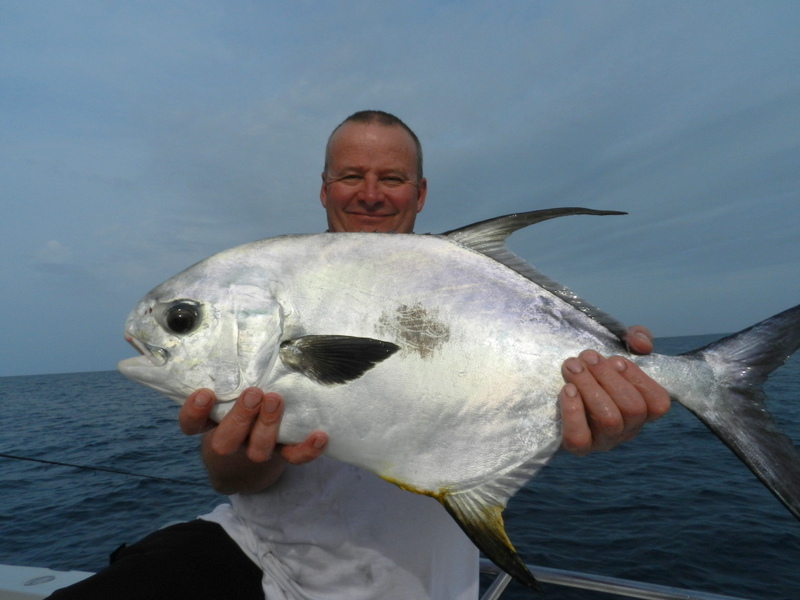 After a slow early morning yesterday on the tarpon in the dark it was 8 miles offshore to tick the permit box. Well the wrecks were on fire as the numbers of permit grow to the height of the spawn fish each drift. The best news was again this year not big numbers of shark we only lost two I know most guys love shark fishing but you don’t want them at the permit spawn. Next week we have some fly anglers here and as the permit are taken very close to the surface in gin clear water I am very keen to give the fly ago, that will be fun in 100 ft of water. Talking afterwards to the guys they were saying that the tarpon is fun but you have to get up at silly o clock and when you have one on it becomes a spectator sport and with the last two fights being 1 hr 20 mins and 55 mins a long wait. 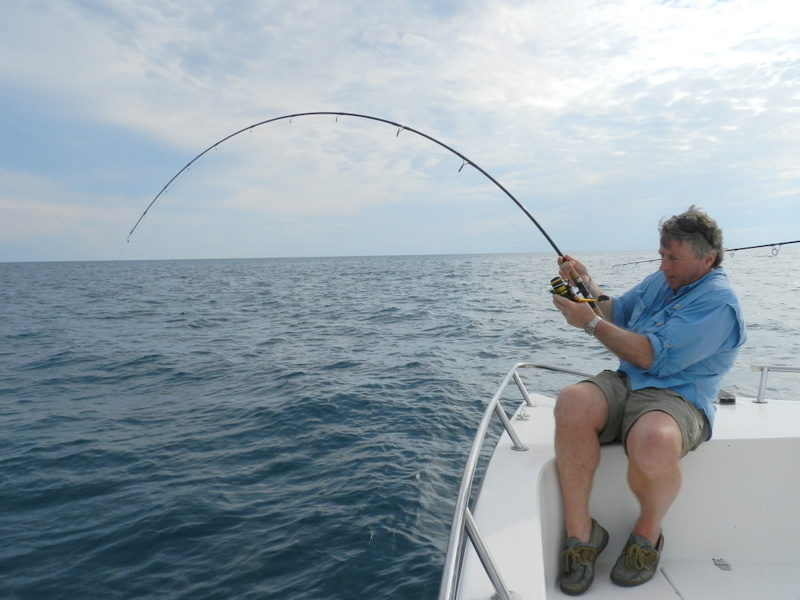 With the permit fishing you can all fish at the same time and it is more than common to have more than one fish at a time. Also you can do it all day when the fish are feeding . After the permit it was back into the bay and we have found an other Goliath grouper wreck but a small tropical storm meant I had to get four very wet but happy guys back. 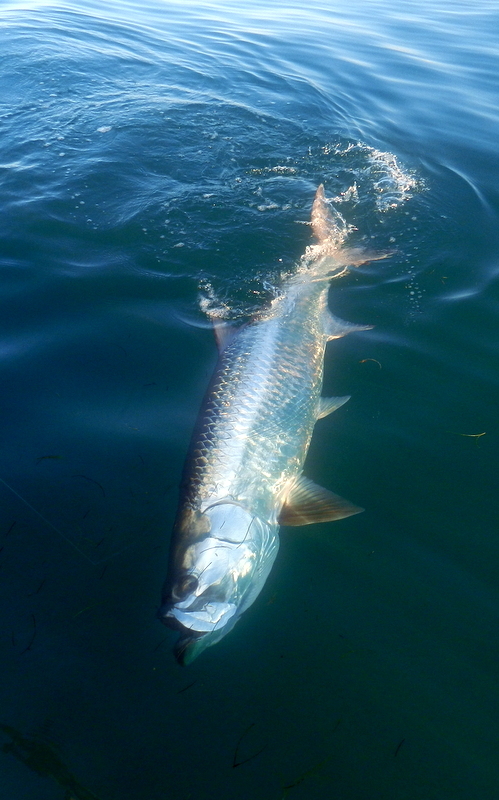 Sorry about the lack of blogs this week it has been 2.30 am starts every day and long days just love tarpon. It is great to see regular Ian again and Kevin, this time Ian has brought his brother Robert and friend Paul. Guess what they would both like to catch a tarpon and permit so game on. The fishing this week has been on fire to much to blog to day and plenty of pics but yesterdaywas very special. Started early 4 am at 7 mile bridge but the tarpon were slow and not seeing any fish were just about to go offshore when the one other boat jumped a fish so ok we will give it just an other half an hour. Well after 10 mins I saw a fish roll near Roberts float then the float went and FISH ON. A long very dogged fight started this fish went through the bridge many times but Robert handled it like a pro and nearly a half a mile from the hook up and after 55 mins the fish was ours. 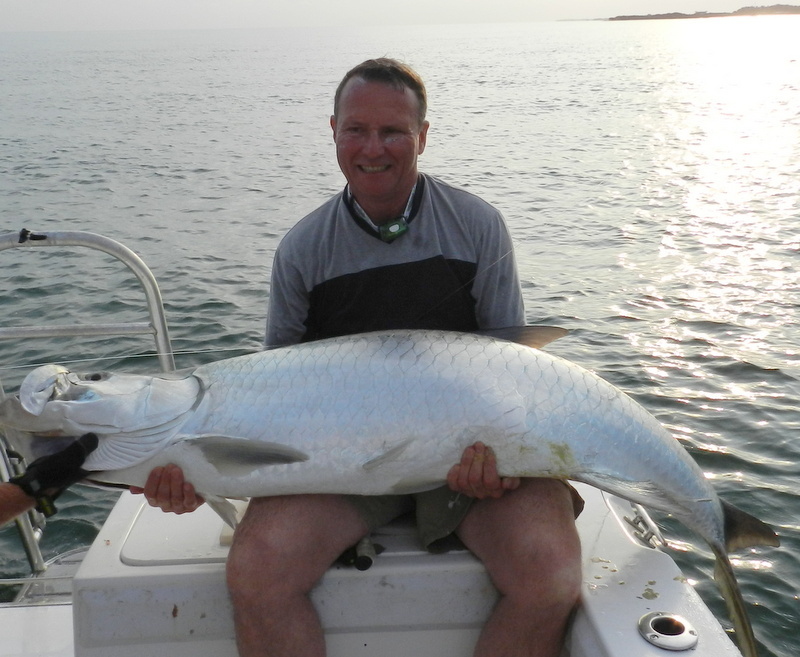 A very fat fish and using the tables came out at 131 lbs not a bad first tarpon at all well done. 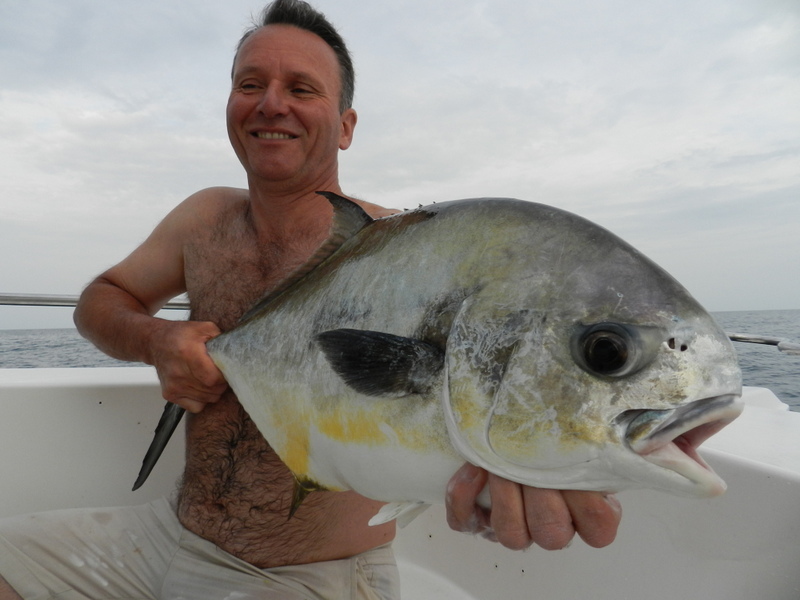 Well after that it was straight out to the permit mark a bit lumpy 8 miles offshore but ok to fish. 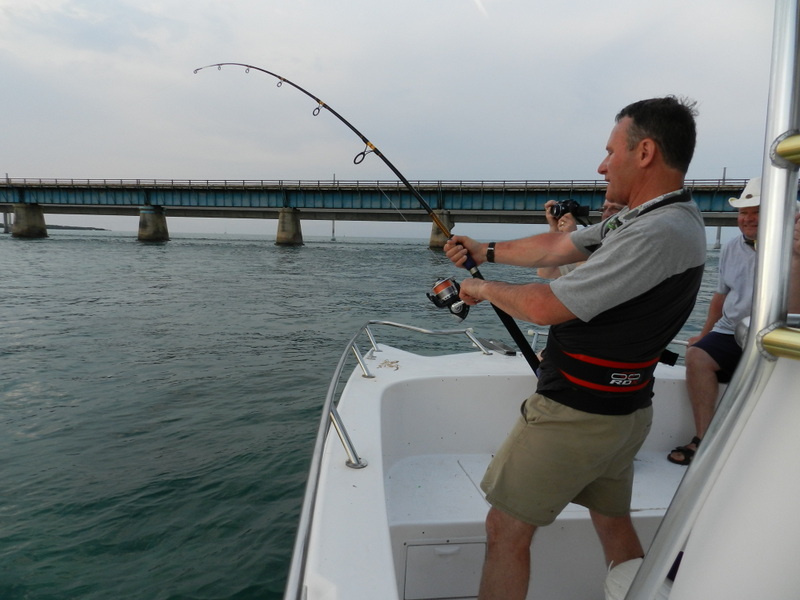 Ian had one on first drift but that ended up as shark food and I was hoping it was all not going to end in tears. 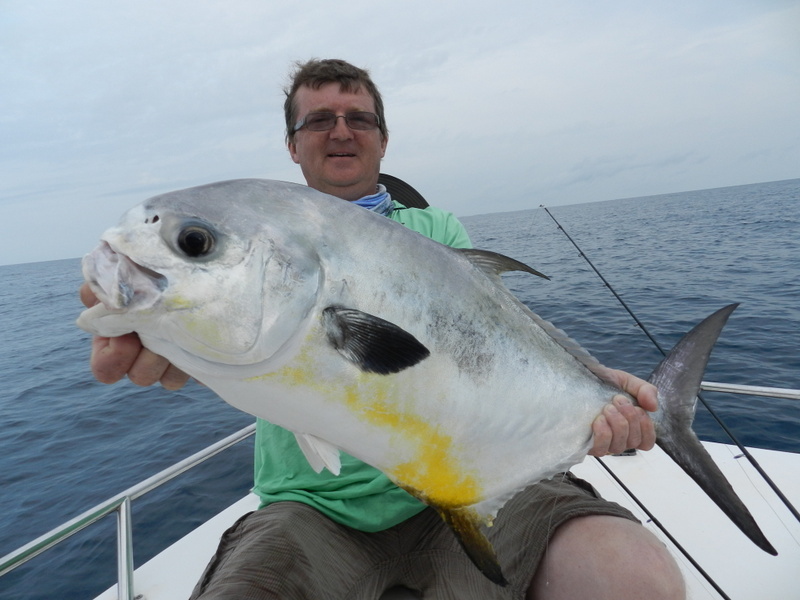 We were having fun with big crevalle just look at the rod bend on Roberts fish but it was Paul who had the permit. What a first permit near 30 lb and so hard a fight in 100 ft water just up and down no stopping but the smile says it all well done part two. Maybe the one bad thing about the Florida Keys is that some people catch tarponitis during their fishing holiday and some people get it bad. The only cure is being dragged out of bed at 3.30 am sent to a scary place and fish in the dark then pain on the rod and the skip shouting at you all the time. The worst part is that there is no known cure and you have to have treatment every year. Well poor old Steve has it bad and the fishing gods gave him is annual medicine on his last morning. The take was fantastic right by the side of the boat and at 4.36 am the cry went up fish on. Not to many jumps which I like and then through both bridges and out into the Atlantic. The fish seem to give up after 10 mins but once into deeper water it was a very different story and for the next hour 10 mins a very, very hard fight. 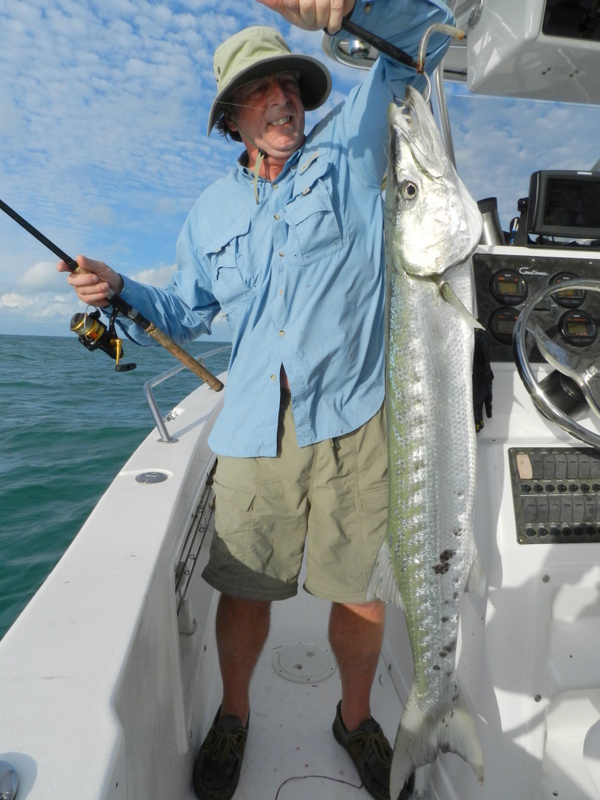 Well Steve did well and in over 12 years of tarpon fishing his angling skills were right up there at the top I lost count of the times it charged the outboards and went under the boat all handled by Steve no problem. The only sad ending to this story by the side of the boat when I went to hold the fish to get the all important measurement for an accurate weight the hook fell out. This was a big fish and well over 100 lb and nearer 150 lb so well done Steve, guess you will be back for more treatment next year. 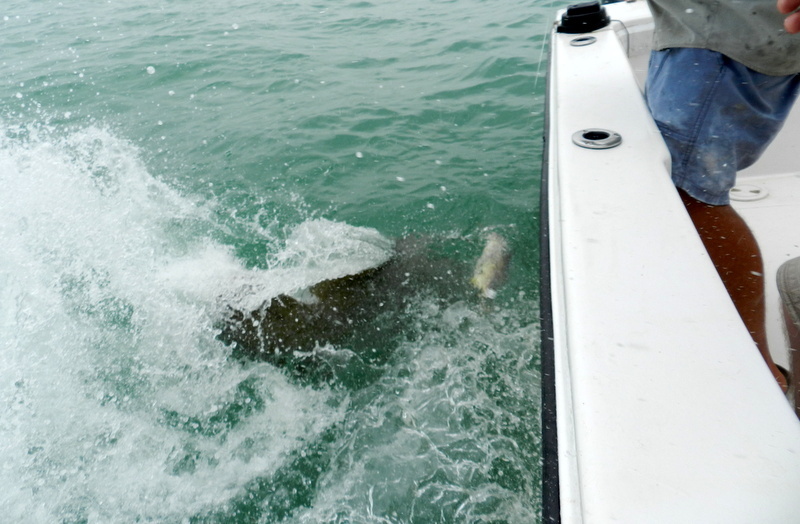 One of the very few problems that we have in the Florida Keys ( and I know some anglers love it ) is that when ever we get large groups of fish the shark appear in numbers. 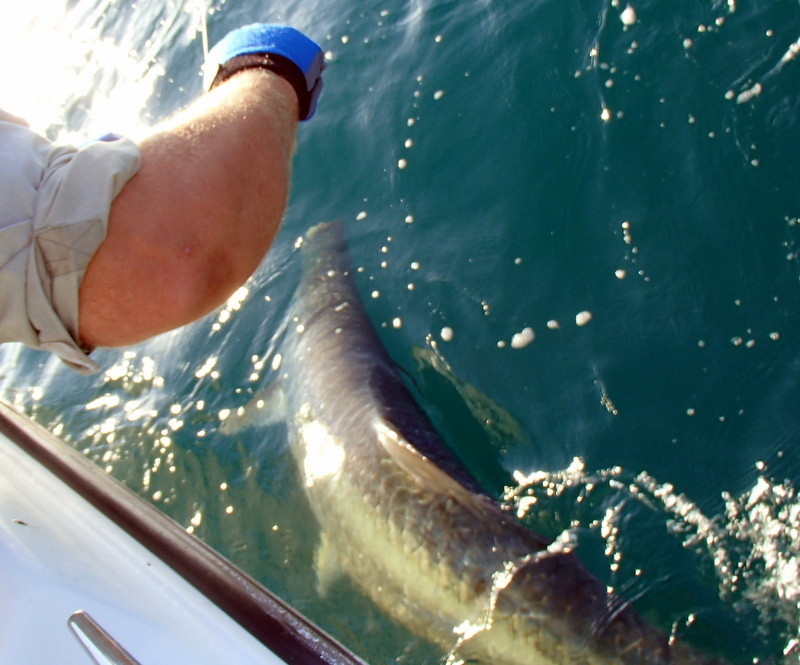 From the mackerel run in the winter to the tarpon migration and thepermit spawn shark are never very far away. On this groups last full day we ended up on the permit wreck and it did not take John long to get stuck in to a hard fighting permit. 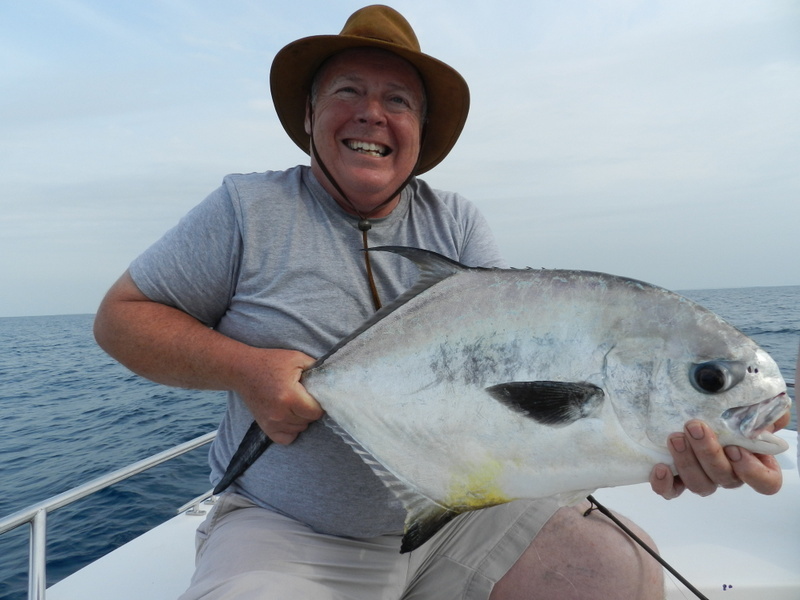 I must just say we have a lot of anglers pass through our fishing holidays and Johns fish fighting skills were right up at the top from his epic battle with the near 100 lb stingray to the hard fighting snapper well done. Well as the fish was getting to the boat bang fish gone and in mid water only the shark do that. Well Billy had a plan and with a nice piece of cuda on the shark rod a bait was drifted back at mid water where John lost his. It did not take to long and shark on, fighting these fish in 100 ft of water is very different to our normal sharking in the bay. Billy stuck at it and despite going under the rope a few times he got the fish back to the boat. Was this the one that had John’s fish I doubt it but just one of the many shark that also enjoy the permit spawn. 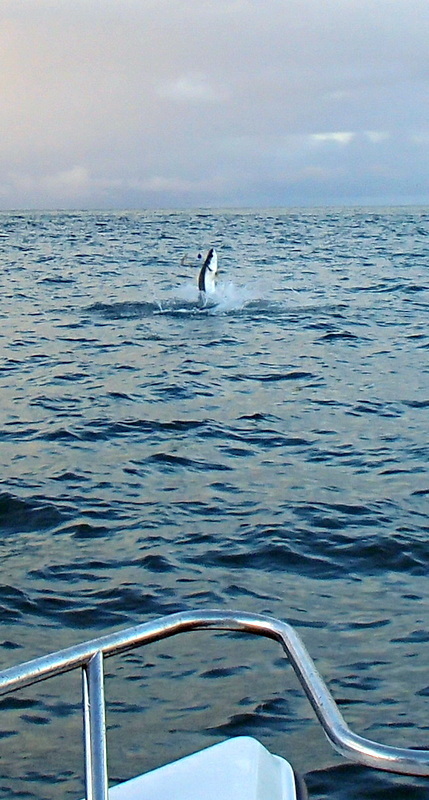 Nice tarpon to the boat on last morning for Steve will blog when Nick sends me the pics. 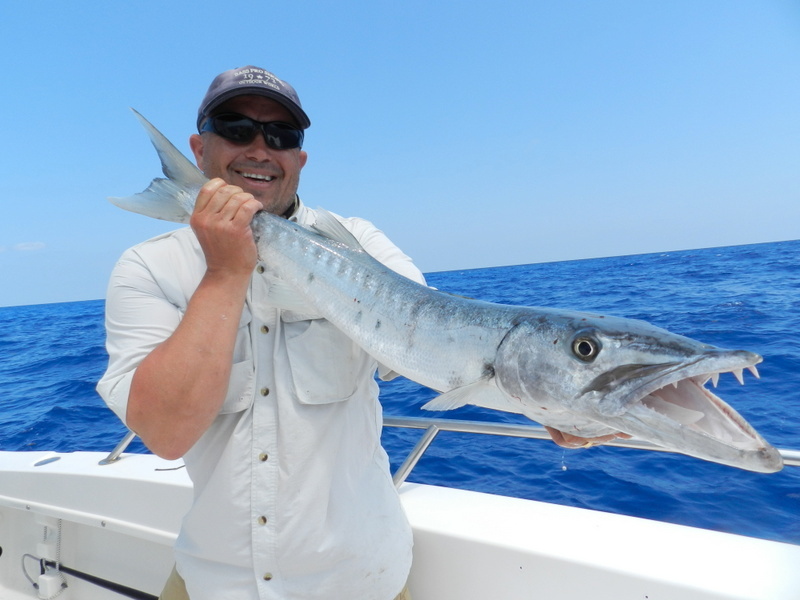 The last two days we have been offshore and after a recent spell of poor weather to be fishing in the deep blue water 30 miles offshore is just a pleasure. Best of all was a fish we did not even catch just 8 miles out a sailfish put on a show that would have got him top billing at Sea World. These fish are one of the acrobatic fish in the Florida Keys and to see them free jumping and tail walking awesome. Back to the fishing the seas have not settled down and the permit spawn has not fully started but there are plenty of fish to enjoy. 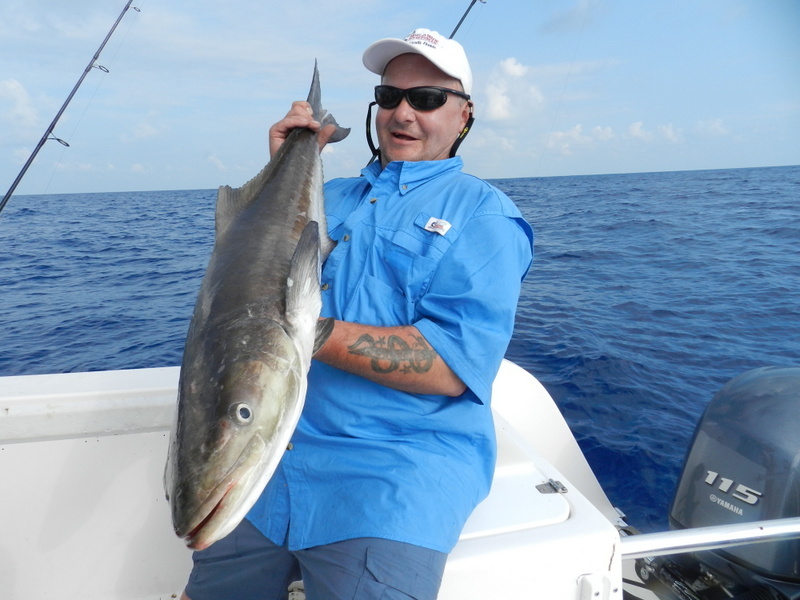 Steve started of with a 20 lb + cobia and in deep water they are a very different fish but Steve won and this one made it to the table a lot of people in the Keys rate this as number one. 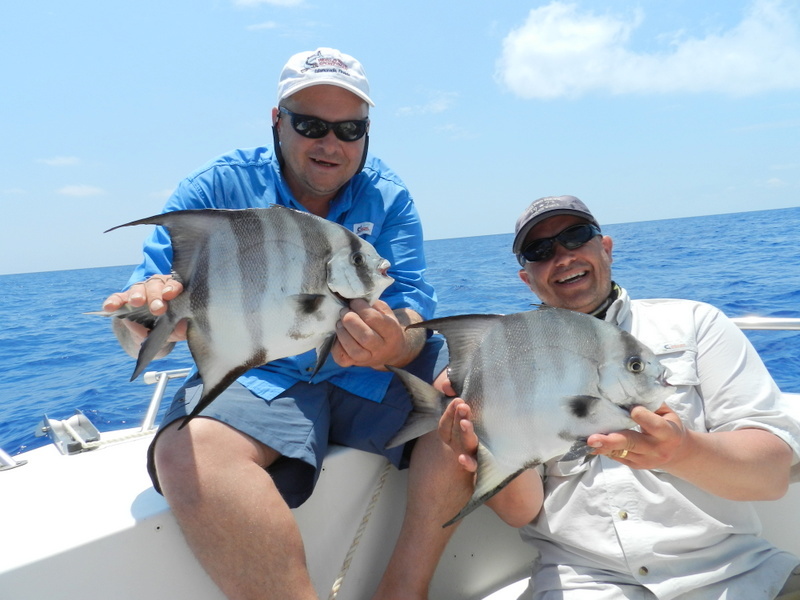 The chum brought up a new species to us the atlantic spadefish just amazing after doing fishing holidays for over 8 years we are still catching new species and this one is number 109. Only averaging 2-3 lbs but in 100 ft water on light tackle they went like crazy and one guy said if they only had these back home. Barracuda turn up in the back of the chum and Nick had a nice one and poor Billy got rocked buy a big grouper and offshore they go over 1000lb so no chance. Yesterday we decided to go to the tuna grounds the seas were big but my boat can cope and it was a long push but the forecast was to get better and with a south wind the run back would be better. When we got ther an amazing amount of feeding birds and tuna crashing on the surface but not taking a lot. 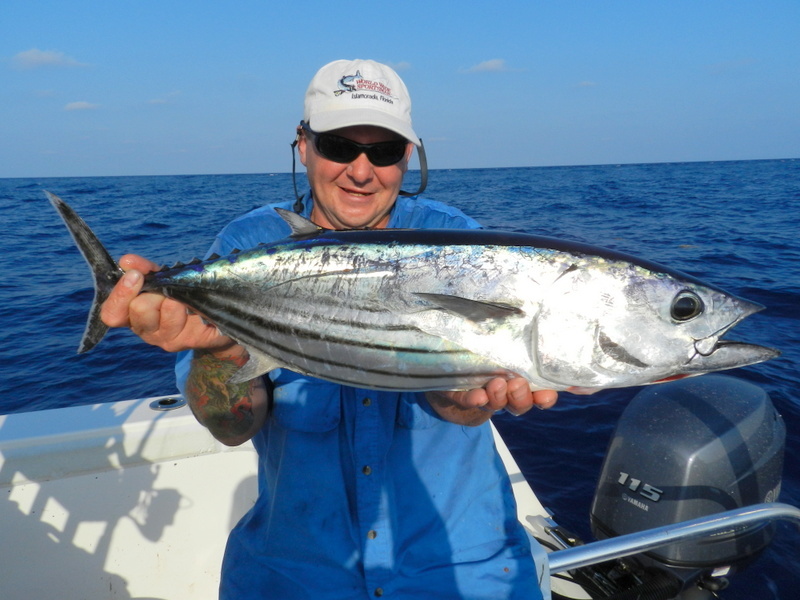 We went though the lot and had a couple of small bonito but Steve had a couple of skipjack on surface poppers fun or what.